Check out these free Veterans Day promotions that are available for military members in 2018. Get free meals at popular restaurants as well as other free giveaways from various merchants. Depending on the specific offer, you’ll have to provide some type of proof that you are an active-duty or retired military member, so review the details closely. Get these free offers for the military on this Veterans Day, Sunday, November 11, 2018, although many events also take place on other days around Veterans Day. 1. Free National Park Entrance – Free entrance on November 11, 2018. 2. BJ’s Restaurant & Brewhouse – Current or retired military simply claim a free Pizookie from November 1st through November 30, 2018, while supplies last. Once claimed, the offer is emailed and valid for 72 hours. 3. Romano’s Macaroni Grill – Romano’s Macaroni Grill will offer a free Mom’s Ricotta Meatballs + Spaghetti entrée this Veteran’s Day (Sunday, November 11, 2018) at all U.S. locations. All veterans and active military can enjoy this complimentary meal simply by presenting military ID or proof of service. 4. Dunkin’ Donuts – On Sunday, November 11, 2018, anyone who shows a military ID at participating Dunkin’ Donuts restaurants nationwide will be offered a free donut of your choice with no purchase necessary. 5. Chili’s – Free meal to Veterans and Active Military Personnel on November 11, 2018. 6. McCormick & Schmick’s – McCormick & Schmick’s invites Veterans and Gold Star honorees (parents and spouse) to enjoy a free entrée on Sunday, November 11, 2018. Military identification will be required. Entrees must be enjoyed at the restaurant. No to-go orders permitted. 7. Sizzler – On Sunday, November 11, 2018, Sizzler will be honoring our military service men and women with a FREE COMPLETE LUNCH. At participating locations until 4:00 PM, Veterans can choose between a 6oz Steak, Malibu Chicken or Jumbo Crispy Shrimp. 8. Applebee’s – On Veterans Day, Sunday, November 11, 2018, Applebee’s will serve 1 million meals to neighborhood military heroes. All veterans and active duty military are invited to visit their local Applebee’s on Veterans Day to enjoy a free full-size entrée from a selection of 8 fan favorites. 9. Golden Corral – Any person who has served in the U.S. Military (retirees, veterans, active duty, National Guard or Reserves) can join Golden Corral for Military Appreciation Night on Monday, November 12, 2018, from 5:00 PM to 9:00 PM to get a free meal. 10. Boston Market – Boston Market, the rotisserie and holiday experts, is honoring all military families by offering a BOGO deal – buy one individual meal with drink and get a second free – on Veteran’s Day weekend (Sunday, Nov. 11 – Monday, Nov. 12, 2018) at all U.S. locations; coupon (but no I.D.) is required and available at BostonMarket.com (available starting Monday, Nov. 5). 11. Chipotle Mexican Grill – Get a B1G1 Free burrito, bowl, salad, or order of tacos for all U.S. military (Active-duty, Reserves, National Guard, and Retired), military spouses, and veterans on Sunday, November 11, 2018. 12. Free Car Wash – Grace For Vets offers free car washes on November 11, 2018. 13. Free Bed & Breakfast Stay – Stay at B&Bs free on and around November 11, 2018. 14. Max & Erma’s – Free Best Cheeseburger in America on November 11, 2018, for veterans and active military, including a 1/2 lb hand-crushed cheeseburger, endless seasoned fries and a fountain drink, valid at participating locations. 15. Texas Corral – Veterans and active duty service members may choose 1 free entreee from their special Veterans Day menu along with an iced tea, lemonade, or coffee on November 11, 2018. 16. Texas Roadhouse – Active, former and retired military can enjoy a free lunch on November 11, 2018. 17. California Pizza Kitchen – California Pizza Kitchen will pay tribute to veterans and active duty members of the U.S. military this Veterans Day, Sunday, Nov. 11, 2018, by offering them a complimentary entrée from CPK’s special Veterans Day menu at all participating California Pizza Kitchen locations nationwide. Participating guests will also receive a card to redeem for a buy one, get one free offer on pizza, pasta, or salad during a return visit Nov. 12-18 (while supplies last). 18. Friendly’s – Veterans and active military get a free Big-Two-Do Breakfast or an All-American Burger all day long on November 11, 2018. 19. Hooters – Hooters welcomes all veterans and active-duty military to enjoy a free meal this Veteran’s Day, November 11, 2018. With the purchase of any beverage at more than 300 participating Hooters restaurants nationwide, military veterans who present a military ID or proof of service will receive 1 free entrée from the Hooters Special Veterans Day Menu, featuring 6 of Hooters’ most popular entrées, including 10-Piece Traditional Wings, 10-Piece Smoked Wings, 10-Piece Boneless Wings, Hooters Burger, Buffalo Chicken Salad and Buffalo Chicken Sandwich (dine-in only). 20. Denny’s – Free Build Your Own Grand Slam for Veterans and Military Personnel on Monday, November 12, 2018, from 5:00 AM to Noon. 21. Bakers Square – Active duty military and veterans can enjoy a FREE breakfast on Sunday, November 11, 2018. Veterans and active duty members can select from 3 Buttermilk Pancakes, 3 slices of French Toast or 1 Belgian Waffle. Just present a valid military ID to your server when ordering. 22. Claim Jumper Restaurants – Get a free meal on Monday, November 12, 2018. 23. Country Cookin – Free meals for veterans from 2:00 PM to 8:00 PM on Tuesday, November 13, 2018. 24. Green Mill Restaurant and Bar – Free meal for lunch or dinner on November 11, 2018. 25. Hurricane Grill & Wings – All veterans and active duty military receive a complimentary entree on November 11, 2018. 26. LaMar’s Donuts – Free donut and 12 oz. coffee for all veterans and active military personnel on November 11, 2018. 27. Mission BBQ – Free sandwich and cake on November 11, 2018. 28. Red Lobster – Red Lobster will be offering a free appetizer or dessert to veterans, active-duty military and reservists with a valid military ID on Sunday, November 11th and Monday, November 12, 2018. 29. Ruby Tuesday – All veterans, active duty and reserve military service members with valid military ID can enjoy 1 free appetizer (up to a $10 value) on Veteran’s Day (November 11, 2018). Offer is valid at all Ruby Tuesday locations, excluding those in Guam, Hawaii, Manhattan, airports or outside of the United States. 30. Shoney’s – Free all-you-care-to-eat freshly prepared breakfast bar from Open to 11:00 AM on Monday, November 12, 2018. 31. Spaghetti Warehouse – B1G1 Free entree beginning on Friday, November 9th that is good through Sunday, November 11, 2018. 32. TravelCenters of America – Veterans and Active Military eat free meal on Monday, November 12, 2018, at select Iron Skillet or Country Pride restaurant locations. 33. Cracker Barrel Old Country Store – Free Double Chocolate Fudge Coca-Cola Cake dessert or Crafted Coffee beverage for veterans on November 11, 2018. 34. Great Clips – Free haircut for all active, inactive, retired, and reserve members of the military. Must visit Great Clips on November 11, 2018, but can be redeemed by December 31, 2018. 35. Knott’s Berry Farm – Free admission for all U.S. veterans, retired, and active military personnel and 1 guest from November 1-15 and November 26 – December 21, 2018. 36. Sport Clips – Free haircuts to active duty service members and veterans on November 11, 2018, at participating locations. 37. Waves of Honor – Free theme park tickets for military members. 38. Six Flags Discovery Kingdom – Free entrance with Military Appreciation Celebration from November 10th to November 12, 2018, in San Francisco / Sacramento, California. 39. Fogo de Chão Brazilian Steakhouse – Fogo de Chão, the leading Brazilian steakhouse, is offering all veterans and active duty personnel 50% off their entire meal on Veteran’s Day weekend (Friday, Nov. 9 – Sunday, Nov. 11, 2018) at all U.S. and Puerto Rico locations; up to 3 guests (for each military veteran or personnel) will also receive 10% off their meal. 40. Superdawg Drive-In – Veteran and Active-Duty Military Personnel can get a FREE Supermeal on Veterans’ Day. Just identify yourself to a cashier or carhop at either Superdawg location in Illinois on Sunday, Nov. 11 or Monday, Nov. 12, for a free Supersandwich and Large Soft Drink. 41. IHOP – Free Red, White and Blueberry Pancakes to Veterans and Active Duty Military on Monday, November 12, 2018, from 7:00 AM to 7:00 PM. Participation varies. Dine-in only. 1 per veteran/active duty with proof of service. 42. Starbucks – Starbucks is offering all veterans, active duty service members, and military spouses a free tall brewed coffee on November 11, 2018, at participating stores. 43. Krispy Kreme Doughnuts – Krispy Kreme will celebrate Veteran’s Day on Sunday, November 11, 2018, by offering a Free Doughnut (any variety) and a Small Coffee to all Veterans and Active Duty Military at participating Krispy Kreme locations. No purchase necessary. A free doughnut and small coffee will be given to anyone who identifies themselves as a veteran or active duty military personnel with no ID required. 44. Outback Steakhouse – Free beverage and Bloomin’ Onion on November 11, 2017 (2018 not confirmed). 45. Famous Dave’s – Free Two Meat Salute on November 11, 2017 (2018 not confirmed). 46. Village Inn – Free breakfast on November 11, 2017 (2018 not confirmed). 47. 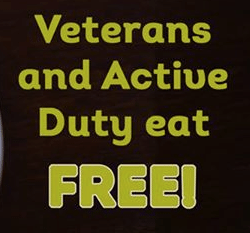 Carrows Restaurants – Free slice of pie for active duty military and veterans on November 11, 2016 (2018 not confirmed). 48. HomeTown Buffet – Free lunch on November 11, 2016, at select locations only (2018 not confirmed). 49. T.G.I. Friday’s – Free Half Rack of Big Ribs or Any Entrée up to $12 for all Veterans on November 11, 2017 (2018 not confirmed). 50. Olive Garden – Free entree on November 11, 2017 (2018 not confirmed). 51. Charlie Brown’s Grill – Veterans eat a free lunch on Friday, November 10, 2017 (2018 not confirmed). 52. Cheeseburger in Paradise Bar & Grill – Free burger with fries on November 11, 2016 (2018 not confirmed). 53. Bonanza Steakhouses – Veterans and military get a Free Buffet on Saturday, November 11, 2017 (2018 not confirmed). 54. The Greene Turtle – Free entree for up to $12 in value on November 11, 2017 (2018 not confirmed). 55. Tijuana Flats – Free meal on November 11, 2017 (2018 not confirmed). 56. Meineke – Free basic oil change for veterans at participating locations on November 11, 2017 (2018 not confirmed). 57. Scottsdale Bullion & Coin – Scottsdale Bullion & Coin will be honoring veterans and active military members by offering them an exclusive 1% discount on all purchases made between November 9th and November 11, 2016 (2018 not confirmed). Please feel free to post additional free Veterans Day offers in the below comments, and I’ll update this list accordingly. Thanks Max and looks like I have a busy Friday. The following local casino is part of Pinnacle Entertainment. Today, I got an email from Steak ‘n Shake, stating they will offer vets “Free Breakfast & Coffee” tomorrow. Locations are YMMV and time 6am – 11 am. Arby’s is again providing a free small roast beef sandwich. Valid at participating Arby’s in OK, AR, KS, MO, IL (Greater STL area), CO, ID, WY, NE (Alliance/Chadron/McCook/Scottsbluff/Sidney/ Ogallala, Lexington) & SD (Rapid City/Spearfish& MT (Miles City). A free bowl at participating locations. A dozen free fresh baked cookies. Thanks Max for the time & effort you put in to this to HONOUR the HEROES on their day!! In my opinion these HEROES should always be recognised, not just on Nov. 11th. I really appreciate that it cover’s coast to coast. One last thing Happy Veterans Day to all the Vet’s in my life past & present, thank you & love you all!!! Hey fellow vets, check out your local Lowes, they give 10% off purchases EVERY DAY with ID. As for discount at register. On-line purchases are a PITA but ask for help and you can get it done. HD only offers 4 days a year. Vets day Labor Day 4TH of July and one other I forgot.